There’s much confusion over which days of the week to start and end your Sprints. Many teams new to Scrum simply choose to start their Sprints on a Monday. After all, it’s the start of the work week. And since most Sprint durations are some multiple of one week, the end of the Sprint naturally falls on a Friday. Here’s why starting on a Monday and ending on a Friday may be a bad idea. Not everyone is at their best on Monday morning. Shaking off the detritus of the weekend and getting back into the work groove can sometimes take a good part of the day. Plus, Mondays get more than their fair share of late arrivals to work and often fall victim to an extended 3-day weekend. A Sprint Planning meeting held first thing Monday morning may not capture your team at their best. The bookend to Monday Fog is Friday Fatigue. After a week of intense, focused team collaboration, despite a Sustainable Pace, many of your team members may have already mentally checked out for the weekend. Fridays are also prone to the same extended 3-day weekend problem as Mondays. Getting your whole team together Friday afternoon can be a bit of a challenge. The quality of feedback captured during a Sprint Review meeting held on Friday afternoon is likely to suffer as a result. Sprint Planning and Sprint Reviews always benefit from stakeholder input. For example, a Sprint Planning meeting is more effective when a feature’s business stakeholder is available to clarify their needs. And the purpose of the Sprint Review is to gather feedback from these same stakeholders (and others) about the “done” feature to determine what to do next. If any of these stakeholders are absent, there’s a significant lost opportunity for value creation. Imagine the inconvenience to the stakeholders if the Sprint Review is on Friday afternoon and the Sprint Planning is the following Monday. It would be great if Scrum Teams always worked close to their stakeholders. However, more often than not, stakeholders do not work in the same place as the Scrum Team. This physical separation means that many stakeholders must travel some distance to where the meetings are to be held. If this distance requires a flight or overnight travel, putting a weekend between the two meetings is a big barrier to stakeholder participation. 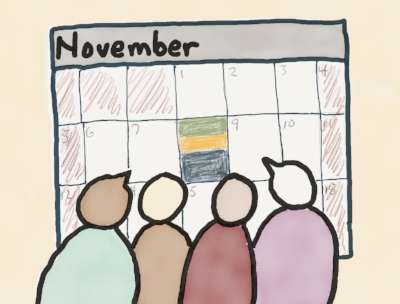 Scheduling the Sprint Planning and Sprint Review meetings in the middle of the week creates the opportunity to hold all of these meetings in one day. The Sprint Review and the Sprint Retrospective of the Sprint that is finishing are held in the morning and the Sprint Planning for the following Sprint is held in the afternoon. Yes, it is a busy day, but the focus is just two Sprints worth of work. The potential payoff of this 1-day investment is big. Collaboration is essential to value creation using Scrum. Starting and ending your Sprints mid-week is an easy way to boost collaboration by facilitating and enabling optimal stakeholder and Scrum Team participation in the Scrum meetings that begin and end the Sprint.